Can anyone, I wonder tell me anything that is actually fit for purpose out their in the public sector. No really, just one example of a big government project or department. You know, like the Child Support Agency, The Probation Service, the Immigration Service, and The NHS. Come on… just one. I had another experience of the Inland Revenue this month. Sitting on the board of creditors for a company in administration for the last four years, we’ve been waiting for the all clear to pay people back a percentage of the money they lost, including the company’s employees. Everything was held-up earlier in the year when the Inland Revenue, as a preferred creditor – isn’t it always - disagreed with the administrator, one of the UK’s largest accountancy companies. To cut a long story short, the administrator calculated that the Revenue were owed £200,000 in unpaid National Insurance and the Revenue the threw their toys out of the pram and insisted that they were owed over £600,000 with a barrage of paperwork that has taken two months to work through, running up more accountants fees, which means that everyone, including the poor former employees would be paid less. The final forensic accounting examination revealed that the Revenue were in fact owed just over £150,000, not £600,000. How they had arrived at the latter figure is an example of either breathtaking incompetence, the use of a random number generator or perhaps both but at least the employees will receive a little bit extra. Mind you, with a million people apparently charged late penalty fees for their personal tax returns, which arrived on time, are we surprised? Back in the real world, the Bank Holiday doesn’t look promising. 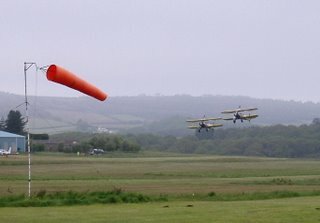 The cloud wasn’t much higher than 500 feet at Sandown on the Isle of Wight this afternoon and I came across the Utterley Butterley wing walking team, trapped there on the way to a display in France. After two hours or so sitting in the restaurant hoping that the weather might lift, they gave up and made a dash for home at very low level towards, lost in seconds against the rolling mist. They’re looking forward to dropping in for the Kent Airshow here next month and the two new girls, both very petite, have rather more courage than I have, standing on top of a biplane’s wing.